Joseph Hyrum Spackman was the youngest child of twelve children born to Edwin and Rosanna Black Spackman. His parents lived in England and came to America in 1880. They brought six children with them. They buried one child in England, a boy, named William George. (Born 26 August 1874 and died 24 August 1878). Those children who came with them, that were born in England were: Amos, Annie Maria, Charlotte, Henry Edwin, Alice, and Francis Albert (Alf) who was just a baby. They settled in Richmond, Utah where Sarah Jane was born in 1881. They then moved to Cove, Utah where Alma was born in 1883. Next a little girl was born and named Ellen. She died as a child. 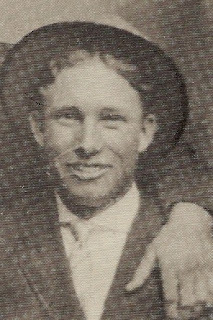 Then Brigham was born at Cove, Utah in 1887. Annie Maria had married Andrew Allen of Cove as his second wife. Things were bad at this time for the polygamists. Andrew Allen hired Annie’s father and mother, Edwin and Rosanna, to take Annie and move south. About 1887 they left and went to St. George, Utah. Here Annie’s second child, Rosanna, was born in 1888. Charlotte met Thomas Sullivan and they married in 1888. They lived in St. George and Leeds, Utah for years. The Spackmans and Annie came back to Provo, Utah where Hyrum was born in 1889. (It is said that Grandpa Hyrum only weighted about 3 pounds at birth and that he could fit very nicely in a quart teacup.) They lived in Provo about a year and then came to Lewiston, Utah where they rented a place straight west of Lewiston down by the river. About 1895 they then moved to Trenton and ran the Bullen milk ranch. They milked so many cows that they hauled their own milk to the factory. About 1900 they moved to the crossroads this side of Richmond where they lived until the time of Hy’s father’s death. I believe this was the first property they had owned since they had come to America. After Hy’s father died his mother moved to Preston and lived in the house that Ted Spackman, Hy’s son has. She lived there until the time of her death. Hy’s father has said that when he left England he had been employed as a caretaker of a stable of very fine horses, that were owned by a rich man. None of Hy’s mother’s folks came to America that we know of. All of his father’s family came, also his grandfather and grandmother. This picture was given to Grandma by Grandpa when they were married. Grandpa is the one on the right. A story is told by Grandma about the young man on the left. Wen she worked at the meat market the power line was being installed down the middle of Main Street. One day she heard men yelling and carrying on outside. She went out and just as she got to the door, she saw a man fall to the ground. He had been electrocuted and was dead before he fell. It was a Merrill boy from Lewiston. After she saw this picture she found out that it had been one of Grandpa’s best friends. 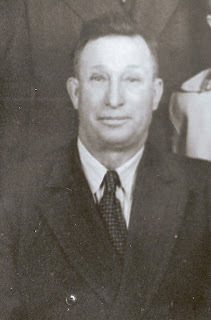 Hy worked around Richmond until about 1909. He worked for James Sheppard in Richmond for about 2 years. Sheppard had two wives and Hy would stay a week at one wife’s and then move to the other one’s for a week. He ran a header with six head of horses to head grain in what they called the south fields, west of the high school. He worked for Newell Bullen and Hershel Bullen at Richmond and Gentile Valley on the Black Canyon ranch which was near Central on the west side of the valley. While working on this ranch he would tell of how at night when they were watering, how he would hear the rattlesnakes. They would kill dozens of them during the day while they were working. In later years he would wake with a start after dreaming of hearing the sound of those rattlers. Hy loved to dance. While working in Richmond he would drive a horse and buggy to Smithfield to go to the dances. He had a steady girl friend, named Rose Milligan, up until the time we met. She told Hy she was going to pull all of my hair out. I met Hy in 1910 while he was working in Gentile Valley. I met him at his brother, Alma’s, home in Richmond. When he came down to Preston and Richmond from up the valley he came in a white top buggy or he rode a horse most of the time. He was a good neighbor to a fellow who lived out by the ranch he worked on in Central, his name was Corbett. Some of the boys have told Nelda and Glenn of how kind Hy was to their mother and family. He worked in this part of the country until we were married in 1912. Hy and I lived with my folks on the farm which Hy and my father had bought together, the first year that we were married. Spending three or four months at Richmond with his folks while Hy worked campaign at the Lewiston Sugar Factory. After a year we moved to the Pratt place where we lived for five years, Hy farmed and raised cattle. Many a night he would bind grain by moonlight, half of the night. After five years we moved over to the farm and my mother and father moved to town, where they lived until the time of their deaths. When the power plant was built up the narrows, Hy hauled cement, lumber, pipes, and everything up there. They had a half-way station where the canyon widens and a telephone, so if the weather was bad, Cap Smith, the contractor took the loads the rest of the way with mules. They would load here at nights so as to get an early start the next morning. Hy got the mumps that fall and was real sick for about a week. Edwin was about three weeks old. I took the mumps but was not real sick. We suppose Edwin had them as he never got them later, but we did not know at the time. In the spring Hy would go for a week to camp at Mink creek to clean the water ditch. He would go in the wagon, so bedding and grub had to be ready for the week. We had a grub box with a lid, that we kept just for this purpose. Then there were frying pans, coffee pots, and the like to get ready. Sometimes it would rain before the week was over. I would always hate this because things would have to be done all over again. Hy would take the horses and wagon and go to the canyon and get logs for posts and for other things. Sometimes for wood to burn. Hy was a great hand to trade horses, mostly with the men in Richmond. About once a week some of the boys would have to take horses to Franklin, sometimes six or seven at a time, to meet someone from Richmond with horses that Hy had traded for. They would exchange and come back home. You never knew what kind you were getting. But we were lucky as none of the kids were hurt too much. I always worried for fear they would run away with the kids and they wouldn’t be able to hold them and something would happen. Hy hauled milk for 33 years. The boys would take turns as they got old enough. They hauled to Franklin for years with horses and wagons. In the winter with a sleigh. Later they hauled to the Sego Milk factory in Preston. Usually one boy would take the lower route, that was the lower half of the sixth ward, while Hy ate his breakfast and he would take it from there to town. Hy had a team of mules that was a really pretty team. The snow would get so deep and they would make such little tracks and could get around so easy. But it wasn’t long and Hy traded them. I think later he wished a hundred times he had kept them. He always saw that the kids had ponies to ride. He was good to his horses, cows, and other animals. In fact sometimes he kept them too fat. The men who came from Richmond to trade horses, always said they could tell Hy’s place as he always had a big hay stack. Hy would work for a long time getting a matched team. He would get one horse and then look for a long time before he would get another to suit him. Just as soon as he would get them matched he would get a good trade and start over again. He would get some of the teams ready to pull at a pulling match. He loved to train them and pull things at home. We didn’t pull at matches very many times. We had a horse named Black Old Cap that Hy would take up the canyon when they would go to log. They could take him up to the top, hook a log on behind and turn him around and let him go. He would go down the hill and someone would undo the log and turn him around and he would go up the hill alone. He could also unload hay onto the stack without anyone guiding him. Hy would tell him to pull up and when to stop and he would run the Jackson fork. One time when we had three or four little kids, Hy and I had driven to Richmond to pick raspberries at his father’s place. His father raised beautiful fruit and garden. We were coming back after dark that night in the buggy when one of the horses stumbled and broke the tongue. We were just about home and were on the road that we call Skunk Lane. Hy took the horses and went up the hill to his sister’s, Jane and George Hodges, to get a buggy to come and take me and the kids home. While I was sitting there waiting, with the kids asleep, I looked up and saw a white image coming towards me. It looked like something in a long white robe and just as if it were floating just above the road. I was getting real afraid and wondering what in the world it was. The moon was just right that night to make it even worse. When it got close to me and just about the time I was so afraid, it called out to me. It was Jane in her long white nightgown and she had run down to tell me that the horses had gotten scared of something just as Hy was coming out of the gate and had bolted and thrown Hy down breaking his shoulder. The double trees had come undone. Hy had very few accidents. One time he was building a fence down by Ross’s house and drove a nail through his wrist. Once after haying, there was a hole in the loft of the barn, Hy threw one of the pitchforks up and thought it was going to go through the hole. Instead it came down and hit him in the upper arm. This was very painful at the time. We went to take him to the doctor, but he couldn’t stand the ride. The nearest phone was up to Hart’s, so someone went and called the doctor to come down. My mother came down and hot packed his arm all that night. The doctor said he would probably have a stiff arm for the rest of his life if we didn’t do this. He had no ill effects. Hy hauled gravel and payed $200 for his assessment on the 6th Ward Chapel, when it was built. This doesn’t sound like much now but at the time it was a lot of money. He hauled load after load of gravel for the Sego Milk Factory when it was built in Preston, which he was paid for. This gravel was hauled from a place by Battlecreek. He also hauled gravel for the 2nd Ward Chapel helping my father, Samuel David Jensen. Father was ill at the time and couldn’t work so Hy offered to do his share. He was always polite. I never remember him not being so. He loved to sing and dance. He would line the kids up in a row and take turns dancing with them. This is something that they will always remember. He was fun loving and would dress up and try to fool the kids whenever he felt like it. On April fool’s day he always had something to pull on the kids. At Christmas time he would go out and get the sleigh bells and then tell the kids Santa was coming so they better get to bed. He loved to decorate the Christmas tree and would have a lot of fun doing this. Singing while we did this. I have always said after watching the television and some of the soft shoe dancers, that Hy could do even better than that. He could really soft shoe dance. He would buy a sack of candy and spend time trying to fool the kids by telling them he would get it out of the light or that he found it up in the transoms. Hy was drama director in the Mutual for about two years. Also ward teacher for a while. The kids remember when he took part in a play. He was a confederate soldier. I remember going over to Dayton with a play. Hy was always an early riser. Ted said he remembers his Dad getting up at 4 o’clock in the morning and waking everyone up. Hy worked for Virge Knudsen at the Packing Plant for about fifteen years. He hauled cattle, and would go up to a ranch in Strawberry canyon near Soda Springs that Virge owned. He would go in the summer and stay alone and take care of the range cattle. There was a two-room house with a corral and cattle shed. Also a very deep well with a pump. When they got water they usually hauled enough for a two-day supply of it at a time. In 1951, Hy was operated on for a double hernia. Dr. Smith here at Preston performed the operation. They had operated in the morning and towards evening Hy kept complaining of all the gas he had. I told him he was just feeling sorry, as you usually didn’t have gas until the third day. He kept having spells, going unconscious, but no matter what I told the doctors they didn’t believe me. Finally, the nurse came in and pulled the covers down and blood was all over the bandages. She called the doctors and Smith and Hawkes said there was nothing wrong. Hy was a bleeder and had bled from each stitch again. Dr. Smith told Hy he wouldn’t go back to work for six months, but in about six weeks he couldn’t stand being idle, so he went back to work. Dr. Smith told Hy that they had sown him up so tight that he would have a hard time the rest of his life.